Take your starter from the fridge and let it come up to room temperature. 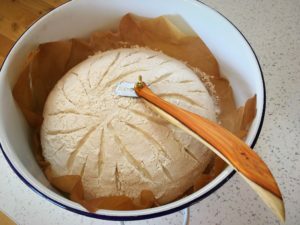 Feed it with 30g of strong white flour + 30g of water, stir it well, and allow it to become fully active and ready to use, this can take 2-3 hours if you starter is as active as mine, maybe a bit longer if your starter is less active or your kitchen is cold. If you feel that the mix feels a bit thin, add a tablespoon more of flour. Check out this page more information about your starter. 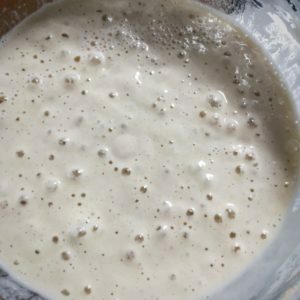 Once your starter is bubbly and active, and looking like the photo below, you can start putting your dough together. 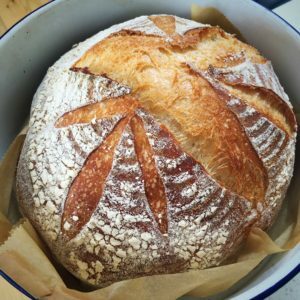 The process for making this loaf encompasses nearly 24 hours but the actual hands on input required is very little, 30 minutes at most. Start this process when your starter is ready, around mid afternoon works well, preferably around 4pm. Mix it all together loosely, so that it’s pretty ragged but all the flour and water is mixed. It will look like this..
Cover the bowl with a plastic bag or shower cap and leave it for an hour or so on the kitchen counter. 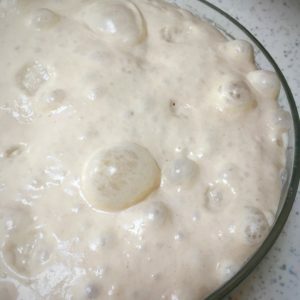 *Put the rest of the starter in the fridge, if you have followed the instructions to revive the dried starter, you should always be left with around 100g of starter so you DO NOT need to feed it again after use, just store it, covered, in the fridge until you need it again. 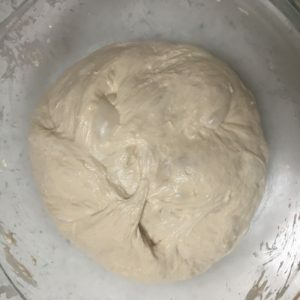 After an hour, lift and fold the dough and bring it into a smooth ball of dough. 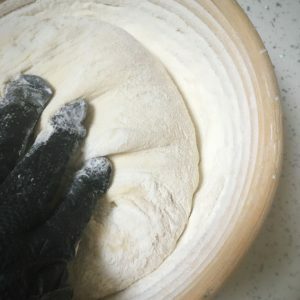 Literally pick up a handful of dough from one side of the bowl, lift it and fold it over the rest of the dough to the other side of the bowl; you don’t need to pull it tight. Then turn the bowl and repeat the process, do it about 20-25 times maximum, until its a smooth ball. 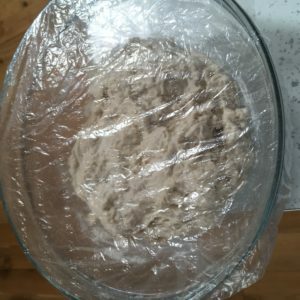 Please note: you will only need to perform this many pulls and folds on this first occasion; after this, far fewer pulls and folds will be required to pull the dough into a ball before covering and leaving it again. You do NOT need to perform 20-25 each time. *I’ve included a link to my YouTube channel below to show more videos of all of the processes. Cover the bowl again and leave it out on the kitchen counter; perform sets of the lifting and folding action 2 to 4 more times over the next few hours; these do not need to be done at fixed time periods apart, as long as you fit in sufficient sets during that time, that’s the key, the more the merrier. And then re cover the bowl, and leave it on the counter overnight. This is often termed as the ‘bulk fermentation’ period. 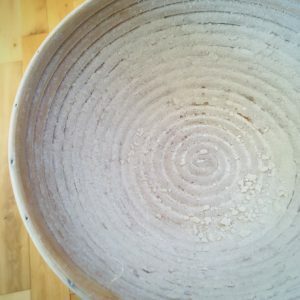 Literally a bowl full of bubbles – a thing of sourdough beauty! Now, get your banneton out and liberally flour it with rice flour. 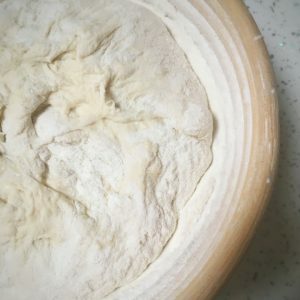 It needs to be really well floured, all the way up the sides, so that the dough doesn’t stick. 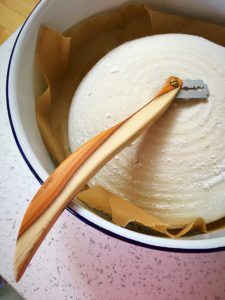 *If you have a new banneton, when you first get it, spray the inside with water, pour in some rice flour and tap tap flour all around the inside of it, moving the banneton around to move the flour. Then let it dry, creating a dried layer of flour inside the banneton. You will still need to add extra flour every time you use it but this gives you a good non stick base. 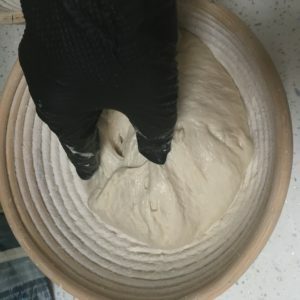 Very gently, perform a single round of lifts and folds with the dough, once round the bowl, a maximum about 10 times, only to bring it into a loose ball again, it should be bouncy and happy. Don’t be heavy handed and don’t handle the dough too much, this is to preserve the carefully crafted bubbles. 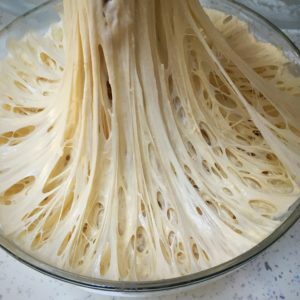 Place the ball of dough, smooth side down into the banneton. 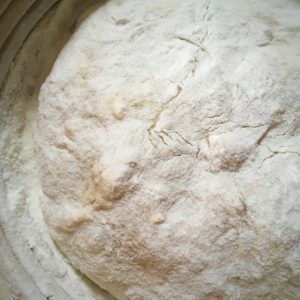 Move the dough aside to be able to sprinkle rice flour down the sides of the dough. And ensure that you sprinkle some rice flour all over the top of the dough too to stop it from sticking to the parchment paper. Cover it again with a plastic bag/shower cap, and put it in the fridge for an absolute minimum of 3 hours, up to 24 hours, the longer you leave it, the more the flavour & stability will grow. I usually leave mine for 10 hours. This means you can leave it there all day whilst you’re at work, or out for the day, and bake it on your return. This is the ‘final proof’. *My fridge temperature is set to 4C/40F, if you fridge is colder than this you might be able to leave it for less time, you may need to test for your fridge temperature to be sure. After this time, preheat the oven to 230C/450F (or 220C/430F if it’s fan assisted). 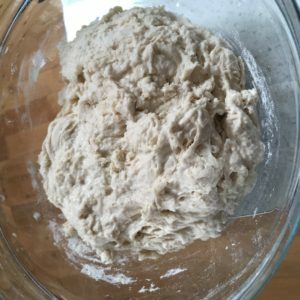 Remove the dough, in the banneton, from of the fridge once the oven is ready. Once the oven is up to temperature, line your enamel roaster with a sheet of parchment baking paper. Place the tin over the top of the banneton, then invert it/turn it all over together to turn the dough into the pot. *Please note: you do NOT need to preheat the pot. 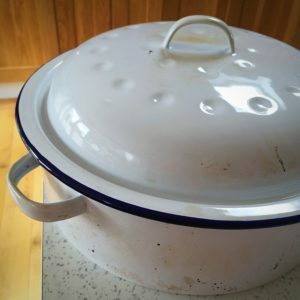 If you are using a cast iron Dutch oven, you still don’t need to preheat the pot. Bake as per below and if when you lift the lid, the loaf seems a bit pale or blonde, put it back in the oven for 5-10 mins to brown. 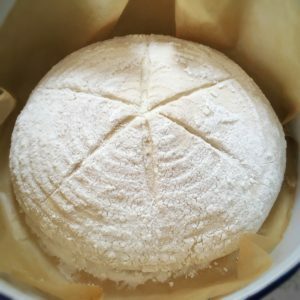 You should now have a lovely dome of dough, that holds it shape, decorated with a pattern of concentric flour rings from the banneton. Score the top of the dough with a lame or a clean razor blade, put the lid on and bake it for 50 mins. *If you prefer a darker loaf or you feel thatvyours look pale, you can remove the lid and bake for a further 5-10 mins; I prefer to keep the lid on for the entire bake as I like the colour I get. Leave it to bake: DO NOT be tempted to peek, do not open and close the oven, resist any urge to do so to look at it. 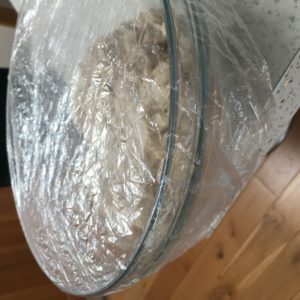 After 50 minutes, remove the whole pan from the oven, carefully take the loaf from the pan, tilt it whilst still wearing your oven gloves to remove the parchment paper from the bottom, (and keep it to use again like I do) then leave the loaf on a rack to cool. Wait AT LEAST an hour before you slice into it. 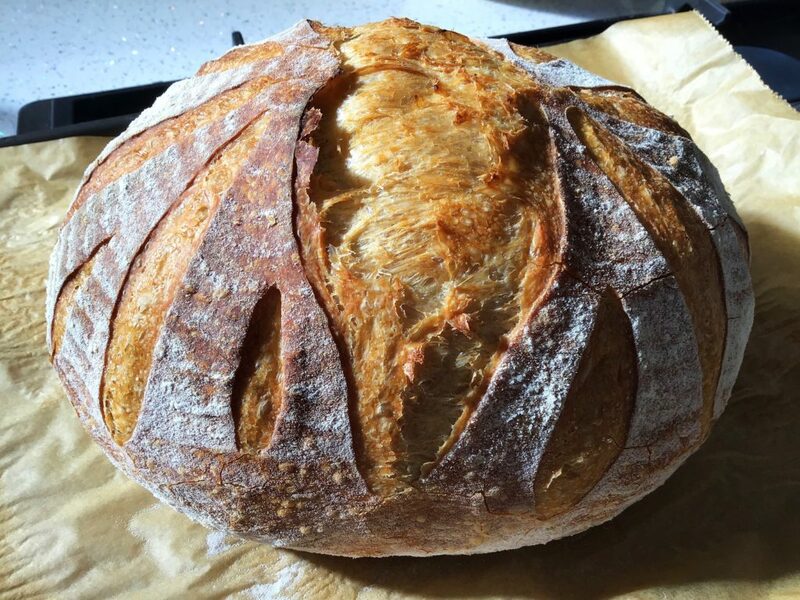 If you cut into the loaf too soon, steam will fill all of those carefully crafted holes and make the bread gummy. 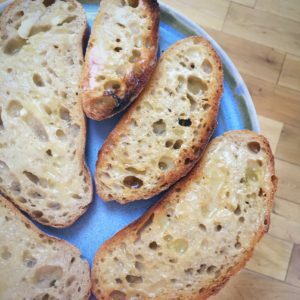 Toasted with lashings of butter! Yum!!! I have put videos for all of the pulling and folding and other elements on my YouTube channel. 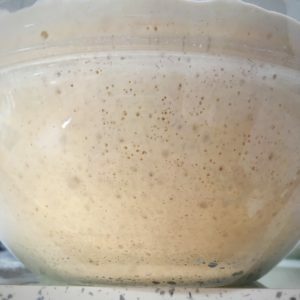 Once you have mastered this process and feel comfortable using the starter and managing the dough, the possibilities are endless, and addictive! 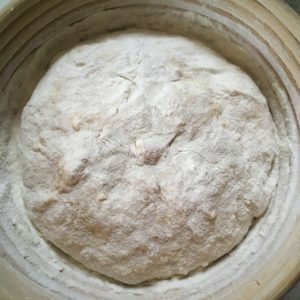 I would strongly advise that you get comfortable with sourdough using non organic strong white bread flour before you start experimenting; it’s a perfect learning ground. And then, experiment at will! 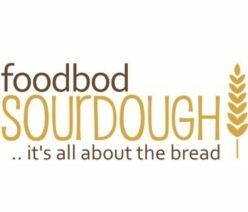 For more sourdough ideas, check out my recipe index for more ways to use your dough, try new flours, bake from a cold start, and have more sourdough fun!